Crocbands are a brand new design from Crocs that borrow from the aesthetic of retro trainers with a white band and coloured stripe around the side of the shoe. 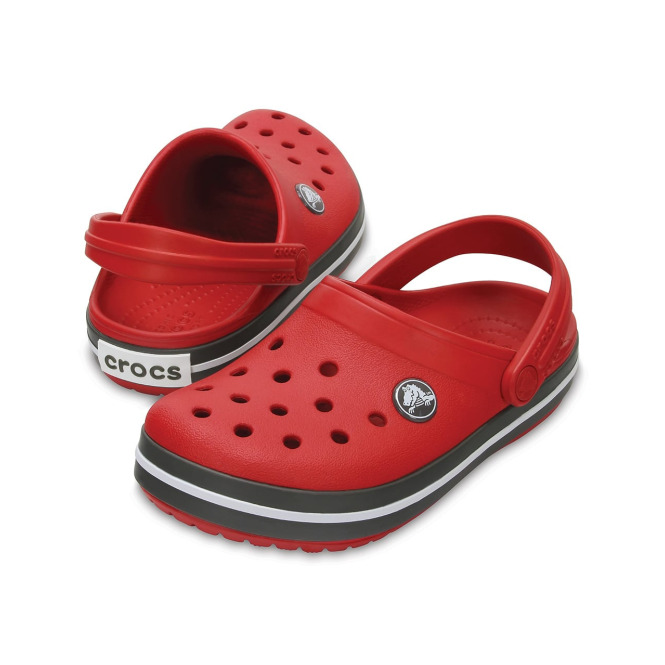 These fantastic lightweight Crocs feature an ergonomonic Italian design which allows the feet to bend and move naturally. The Croslite footbed moulds to the foot to give maximum comfort with its custom fit and the Croslite heel strap gives added security. Crocs are great for wearing around the house, in the garden, on the beach - even in the water! Crocs are also odour resistant. Kids will absolutely love these chilli pepper red Crocbands with graphite band and white stripe - they really are the perfect summer shoes and will look great with any outfit.